9-oz. 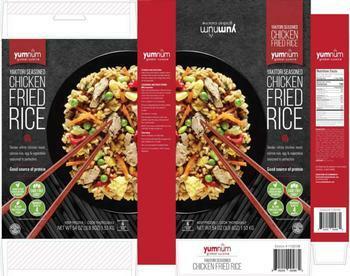 cardboard packages of yumnum global cuisine YAKITORI SEASONED CHICKEN FRIED RICE bearing lot codes C041A8K12 BEST BY 11/12/2019, C091A8L04 BEST BY 12/04/2019, and C091A8L05 BEST BY 12/05/2019. The recalled product, bearing establishment number P-34457 inside the USDA mark of inspection, was shipped to retail locations in Illinois and Michigan.